1) Single layer and double layer winding. 2) Full pitch and short pitch winding. 3) Concentrated and distributed winding. If a slot consists of only one coil side, winding is said to be single layer. This is shown in the Fig. 1(a). While there are two coil sides per slot, one at the bottom and one at the top the winding is called double layer as shown in the Fig. 1(b). A lot of space gets wasted in single layer hence in practice generally double layer winding is preferred. As seen earlier, one pole pitch is electrical. 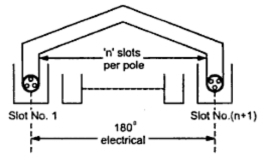 The value of 'n', slots per pole indicates how many slots are contributing electrical phase difference. So if coil side in one slot is connected to a coil side in another slot which is one pole pitch distance away from first slot, the winding is said to be full pitch winding and coil is called full pitch coil. For example, in 2 pole, 18 slots alternator, the pole pitch is n = 18/2 = 9 slots. 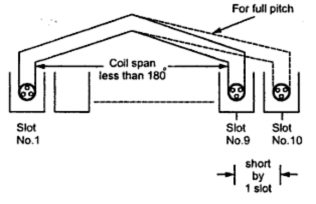 So if coil side in slot No.1 is connected to coil side No.10 such that two slots No.1 and No.10 are one pole pitch or n slots or 180o electrical apart, the coil is called full pitch coil. Here we can define one more term related to a coil called coil span. It is the distance on the periphery of the armature between two coil sides of a coil. 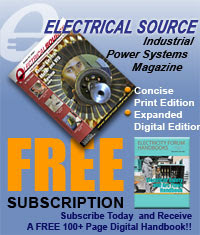 It is usually expressed interms of number of slots or degrees electrical. So if coil span is 'n' slots or 180o electrical the coil is called full pitch coil. This is shown in the Fig. 2. As against this if coils are is slightly less than a pole pitch i.e. 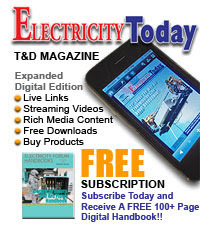 less than 180 electrical, the coils are called, short pitched coils or fractional pitched coils. Generally coils are shorted by one or two slots. So in 18 slots, 2 pole alternator instead of connecting a coil side in slot No. 1 to slot No.10, it is connected to a coil side in slot No.9 or slot No. 8, coil is said to be short pitched coil and winding is called short pitch winding. This is shown in Fig. 3. 1) The length required for the end connections of coils is less i.e. inactive length of winding is less. So less copper is required. Hence economical. 2) Short pitching eliminates high frequency harmonics which distort the sinusoidal nature of e.m.f. Hence waveform of an induced e.m.f. is more sinusoidal due to short pitching. 3) As high frequency harmonics get eliminated, eddy current and hysteresis losses which depend on frequency also get minimised. This increases the efficiency.